Shari on the podium with her gold medal for the 200 metre sprint. 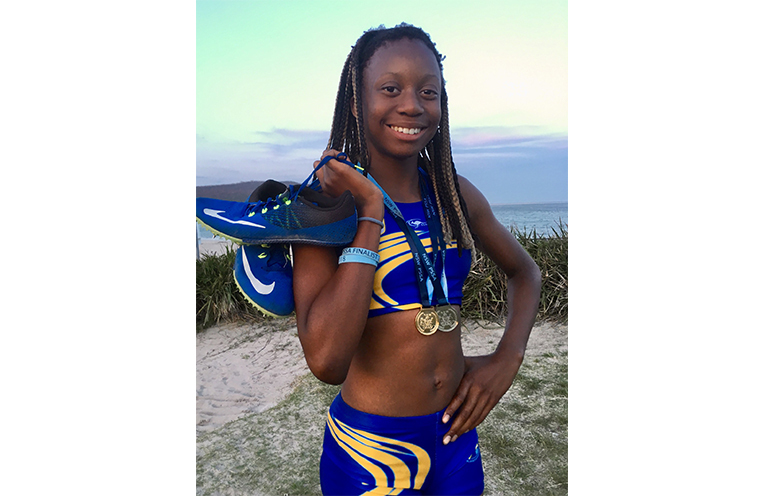 ELEVEN year old Shari Hurdman from the Bay is heading to the Nationals after taking out the gold medal in the girls 11 years 200 metre sprint at the NSW Primary Schools Sports Association (PSSA ) State Championships. 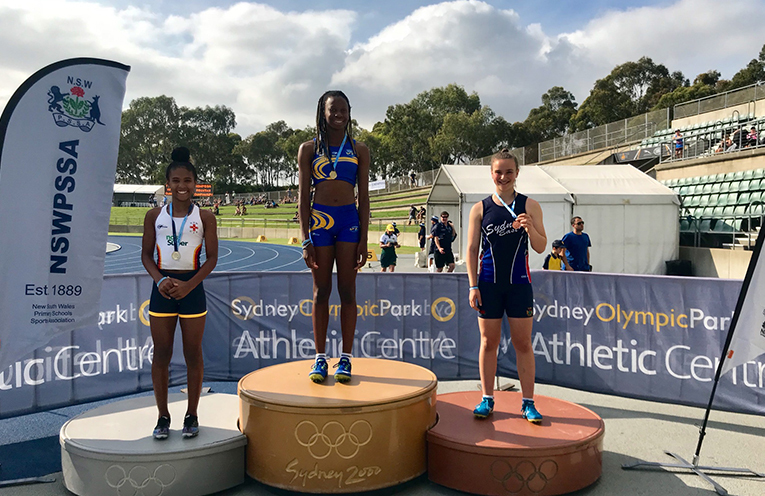 The Port Stephens runner competed against the best in NSW at Sydney Olympic Park and took out not only the gold for the 200 metre sprint, but also a silver in the 100 metre sprint. Hurdman won gold in the 200 metre sprint in her age class in 2017 and now holds back to back titles. While Hurdman was well positioned to take out the 200 metres the surprising result was the 100m silver since she doesn’t train for this event specifically. Determination and strength saw her dig in deep with her powerful legs. With a time of 27.43 seconds in the 200 metre sprint Shari Hurdman will now go on to represent NSW in the Nationals which are being held 23-24 November in Melbourne. In the 100 metre sprint Hurdman clocked in with a more than respectable 13.33 seconds taking out the silver medal. Anja Hurdman, Shari’s mother, told News Of The Area, “The weather was hot and sunny, perfect conditions for Shari. 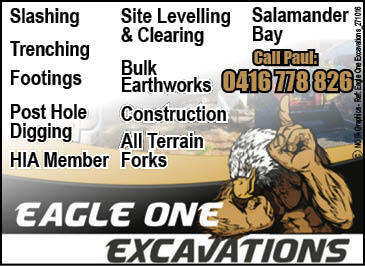 “Her proud coach Bob Walkley was there to keep her focussed and properly prepared for each race. “We are all very excited and immensely proud of her achievements!” she said. Shari is heading to Tomaree High School next year, where she has been selected for the Talented Sport Program class at the school. She also participates in Nippers at Fingal Bay Surf Life Saving Club and is a keen gymnast.